Those of you who were following my blog know it has not been updated in almost a year. While there are many excuses there are no reasons. Mary, Keela and I are just as committed to cruising as before and have been actively traveling between Florida and Nova Scotia CANADA. Our original plan was to bring this boat back to Mexico and we were actually on the way just after purchase. Fate interviened (more later) and we decided to cruise the east coast for a season. Well this will be our second season here and still have not seen 20% of the available ports. With over 1,000 hours on N57 WORKNOT I’m glad we took the risk and made the effort to get another cruising boat in order. While it has been a major task, expense and had its moments of wondering “WHY DID I CHANGE BOATS?” It’s been a great improvement in comfort. A few quick facts on the difference: N57 is only 7 feet longer than N50. N50 weighed 80,000#. N57 just under 120,000#. N57 enjoys a flybridge that N50 did not have. Twin generators assure A/C power when the other genset is down. N50 with a single genset means you will fix it now in a hot, rolly and more cramped engine room. This is one of my favorite pictures of WORKNOT. 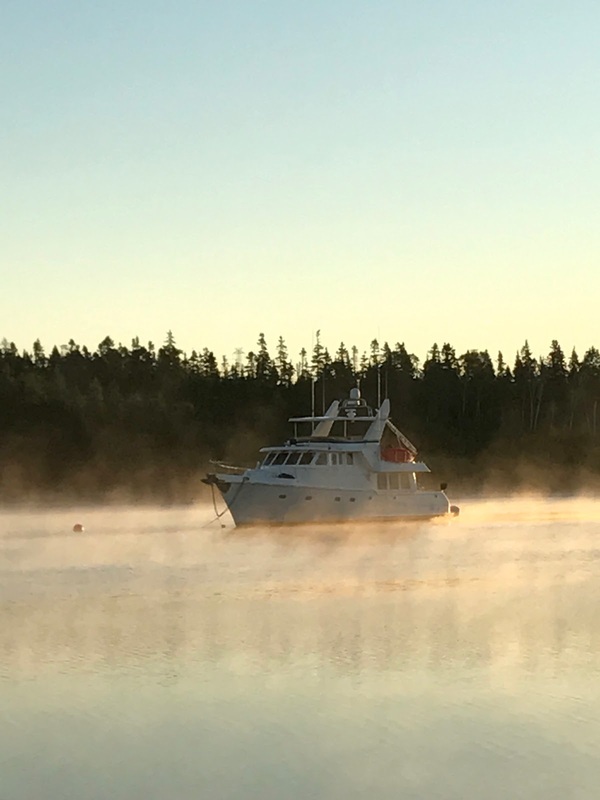 At anchor, at peace, sun rising on another day and ready for what comes next. This one was taken in Nova Scotia last year. Over the next few weeks I’ll recap some of the highlights of our past seasons cruising and work to return to real time updates. Tonight we are a little ahead of the southbound migration fleet here in Brunswick Landing Georgia. For the Nordhavn crowd there are 2 other N57’s, N55 and N46 at the marina.